The jicama (Pachyrhizus erosus) is the plant's edible tuberous root and the name of a native Mexican vine. The root's exterior is yellow and paper-like while the inside is creamy white with a crisp texture that resembles raw potato or pear. Here are 7 health benefits of jicama. 1. Jicamas could improve the immune system. 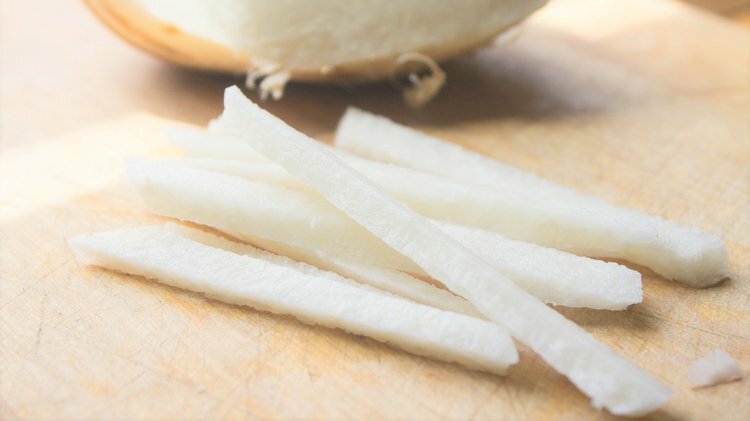 One serving of jicama contains 40 percent of vitamin C. Vitamin C could stimulate the immune system to produce white blood cells, which are the body’s first primary line of defense against illness. 2. Jicamas can help fight against cancer. Jicama contains carotenoids and vitamin C to fight free radicals that prevent the mutation of healthy cells. 3. Jicamas can help one develop strong bones. The manganese, magnesium, iron, and copper found in jicama are essential for building strong, new bones and healing any damage to existing bones. This is also the best way to prevent conditions like osteoporosis. 4. Jicamas can assist weight loss. Jicamas are low-calorie, and nutrient-rich, efficient weight loss diet plans. High-fiber foods also offer the metabolism and support manage body weight. One hundred grams of jicama contains only 38 calories. 5. Jicamas can improve brain function. Jicamas are full of vitamin B6. Vitamin B6 has been linked to increased brain function and cognitive abilities, and jicama has this vitamin is significant amounts. Additionally, vitamin B6 is essential for breaking down proteins into useful amino acids and other forms of protein for humans. 6. Jicamas can help manage blood pressure. Jicamas are a rich source of potassium to help control blood pressure. Since it is a vasodilator and reduces the tension on blood vessels and arteries, jicamas lower the stress on the cardiovascular system. 7. Jicamas can help improve gastrointestinal tract. Jicamas contain the oligofructose inulin, which is prebiotic. Prebiotics are the non-digestible fiber that stimulates the growth and activity of beneficial bacteria that colonize the large bowel by acting as a substrate for them. Kumalasari, I. D., Nishi, K., Harmayani, E., Raharjo, S., & Sugahara, T. (2014). Immunomodulatory activity of Bengkoang (Pachyrhizus erosus) fiber extract in vitro and in vivo. Cytotechnology, 66(1), 75-85. Dini, C., García, M. A., & Vina, S. Z. (2012). Non-traditional flours: frontiers between ancestral heritage and innovation. Food & function, 3(6), 606-620. Noman, A. S. M., Hoque, M. A., Haque, M. M., Pervin, F., & Karim, M. R. (2007). Nutritional and anti-nutritional components in Pachyrhizus erosus L. tuber. Food chemistry, 102(4), 1112-1118. Nurrochmad, A., Leviana, F., Wulancarsari, C. G., & Lukitaningsih, E. (2010). Phytoestrogens of Pachyrhizus erosus prevent bone loss in an ovariectomized rat model of osteoporosis. International Journal of Phytomedicine, 2(4). Mahdavi-Roshan, M., Ebrahimi, M., & Ebrahimi, A. (2015). Copper, magnesium, zinc and calcium status in osteopenic and osteoporotic post-menopausal women. Clinical Cases in Mineral and Bone Metabolism, 12(1), 18. Claus, S. P. (2017). Inulin prebiotic: is it all about bifidobacteria?. Gut, gutjnl-2017. Vandeputte, D., Falony, G., Vieira-Silva, S., Wang, J., Sailer, M., Theis, S., ... & Raes, J. (2017). Prebiotic inulin-type fructans induce specific changes in the human gut microbiota. Gut, gutjnl-2016.